The British Foreign and Commonwealth Office (FCO) released its 2011 Human Rights report, its third, 31 March. The report more extensively covers LGBT rights internationally than the previous year's, which was marked by a focus on Europe, but still shows major gaps. It says that "human rights are an indivisible part of our foreign policy" and that the report demonstrates practical steps taken to improve and strengthen UK human rights work.The UK has played a leading role in promoting LGBT rights in intergovernmental organisations such as the EU, Council of Europe and UN. It has also developed a LGBT rights toolkit which has influenced a similar one for the EU. However work by overseas missions remains patchy. For example, Nigeria travel advice barely mentions LGBT. It covers the existence of Sharia in Northern Nigeria (though this does not apply to foreigners) and that homosexuality is illegal under Nigerian Federal law. This lack of coverage for travellers is matched in Home Office country information for decision makers on Nigeria, which does not mention the treatment of LGBT people. Neither does this FCO report cover repression of LGBT in Nigeria (or any other West African country, including Senegal and Cameroon, both the focus of serious concerns). 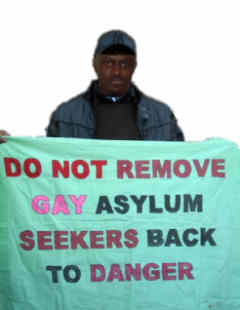 Nigeria is a significant source for LGBT asylum seekers and many have been removed there. "When deciding on which countries to include, we also considered whether the country had been the target of a high level of UK engagement on human rights in 2010, and whether it would be likely to effect positive change in the wider region if their human rights record improved." The report covers extensive other engagement with Nigeria on human rights. The same applies for other countries which heavily repress LGBT and which the FCO engages with on other grounds, such as Pakistan. In Africa the report mentions concerns raised by the Ambassador about Uganda's 'Kill the gays bill' and support for a presidential pardon of Steven Monjeza and Tiwonge Chimbalanga in Malawi. The FCO supported Westminster Foundation for Democracy has worked with the International Bar Association’s Human Rights Institute in Uganda to challenge parliamentary staff on considering the anti-homosexuality bill from a legal and human rights perspective. Apparently "staff agreed that all future legislation should only be presented to parliament if accompanied with a certificate stating that it complied with Ugandan and other international human rights law", however the anti-gay bill has been presented since this declaration. Work which has had almost no international publicity but is mentioned is pressure on the Democratic Republic of Congo against introducing legislation to criminalise homosexuality. Other documented work outside Europe includes an embassy event in China and support for gay pride in Nepal. The Turkish embassy has supported human rights projects which cover LGBT. At the UN, as well as joining with the US and other European countries in lobbying for support in situations like the resolution on extrajudicial killings, the UK has joined in with questioning in the increasing useful Universal Periodic Review system, which examines the human rights records of member states, it says, "focusing in particular on those countries where homosexuality remains illegal". This has led to pressure on the government of Jamaica - who at their most recent review said they would "start a public information campaign to combat discrimination based on sexual orientation" - as well as Malawi. It has also joined with other EU countries in developing a EU LGBT toolkit. Although Foreign Secretary William Hague said in February, in response to a Twitter campaign, that LGBT rights would be raised in Middle Eastern capitals, this report contains no evidence that it has been. Last year's report did include criticism of two Mid-East countries with the death penalty for homosexuality, Iraq and Saudi Arabia. But it claimed that Iraqi "official figures do not show a significant overall increase in violence against, or systematic abuse of, the homosexual community by fundamentalists or militia groups". This year's report makes no mention at all of the violent campaign against LGBT in Iraq. It does mention that Syrian police "regularly clamp down on suspected meetings for homosexuals and there are no recognised associations to campaign for or protect LGBT rights." And this year the situation of LGBT in Iran is discussed, particularly the case of Ebrahim Hamidi. "We continued to condemn discrimination on the basis of gender or sexuality and were very active on the above cases, and in others relating to these issues," it says. "We regularly raised our concerns with the Iranian Embassy in London, and with the Iranian authorities." As well as patchiness in the Middle East, the Foreign Office under both both its previous Minister David Miliband and current one William Hague have been criticised over their refusal to support LGBT Muscovites. Russian and Western activists blasted European national governments and the European Commission, the EU's executive branch, for denying them permission to host Moscow Pride last year on the grounds of an embassy. That would have greatly reduced the threat of violence to which activists are subjected while meeting in Russia. 'I was shocked by how these embassies sold human rights for the sake of economic interests,' Russian gay rights activist Nikolai Alexeyev said. This report mentions that "activists for LGBT rights [in Russia] are likely to seek to exercise their right to demonstrate following the European Court of Human Rights ruling in 2010." Whether the UK will offer any support remains to be seen. Quarterly updates on the report are a new development, as is the ability to post questions. You can directly ask the Minister responsible, the Liberal Democrat Jeremy Browne MP, a question about the report.